Outlook OST file stores all the Outlook data, emails, calendars, task manager, contacts etc as the copy of the original data for the offline use. OST files are created When the MS Outlook is connected with Exchange server in Cache Exchange Mode. MS Outlook 2002 and all its below versions did not support the Outlook OST file size up to 2 GB maximum. So in this situation, if the OST file becomes oversized (means above the 2 GB limitation) then it will become useless to the user and the user unable to access the OST file due to their large size. May be OST file can not open or load. And may be it can not add any new data to the OST file. It will show the error at the time of synchronization. Although there are so many methods available to solve this Outlook Oversized OST file problem. But we have such a great method to instantly recover or access oversized Outlook OST file. Here is the best OST reader tool that is suitable to read oversized OST file. It is tested for 20 GB Outlook OST file. This tool provides the following key features to get the best solution. 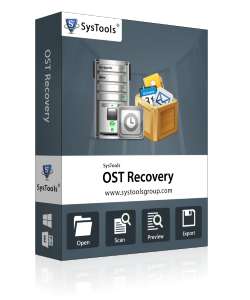 OST reader tool will provide the facility to recover the permanently deleted data of OST files. And also successfully restored the OST file with unlimited file size. After that, the tool saves the recovered data into PST file format. When the convert oversized OST file into PST get corrupted then this software will provide the break option. Means you can choose the PST split option to break it into multiple parts with the same size in GB. Therefore, if you want to resolve the Outlook Oversized OST File problem. Then this is the best software to solve your problems. You can also check it's working through the trial version of this tool but it will recover only 25 items of Outlook OST file. So for the large number OST file, you should purchase the full version of the OST reader tool.